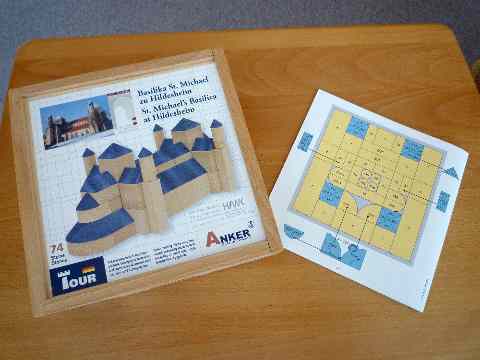 AV Robert Lindner designed a special set for a mini-model of the early Romanesque (10th C.) church St. Michael's in Hildesheim, Germany. The set is available only from this special web site. The set celebrates the 1000th anniversary of the church. The two rounded choir and the stair towers require the special stones, #s 1556, 1557 and 1558. You can see pictures of the church model on the builder's page. In 1960 the DDR factory produced an anniversary model of the Wartburg, in honor of that castle's 600th anniversary. That set is almost impossible to find today. I had an opportunity to buy one in 1979 when I toured the Wartburg. I should have bought one, but it seemed over priced at about, as I remember it, 60 VM. Just a few months ago, my bid on ebay.de of more than US$ 500 did not win. You have been warned! You will remember the set much longer than you will remember the money. Update: Surgery is over; in physical therapy; getting better, but it is a slow process. (I broke my right shoulder on Thursday, October 28th.) At this time I am unable to build with Anchor stones. Next CVA meeting: Saturday, April 9, 2011; Hotel Lapershoek in Hilversum, Netherlands. Note: There will be a Treffen in September, 2011, at the Anchor Stone factory in Rudolstadt. The date has not been set yet. You can now download the entire CD-ROM archive from a new web site. More than 6 gigabytes of data are there, including everything that was on the CD-ROMs. The CVA archive on CD-ROMs has been discontinued. Use the Internet. Please use it! I expect to have all sets, including set 32B, in stock by the middle of January. All sets -- #s 6 through 30A and the NS conversion set -- are in stock! A number of Anchor collectors are members of the international Club of Anchor Friends (Club van Ankervrienden), a Dutch club with members from the Netherlands, Belgium, France, Denmark, Chile, Canada, Hungary, Germany, Austria, Switzerland, Great Britain and the USA. The meetings of the Club of Anchor Friends is held in the Hotel Lapershoek in Hilversum. For the month of January, 2011.